All transactions are safe and secure with a reliable history in online purchasing behind each of our associates. Buy the Knowing is Half the Battle t-shirt to own G.I. Joe clothing and merchandise. The popular G.I. Joe cartoon is often remembered for its Public Service Announcements (PSAs) that involved one of the Joes giving an important safety lesson to a group of kids engaged in risky behavior. The PSA would end with the memorable exchange, "Now we know!" "And knowing is half the battle." These G.I. 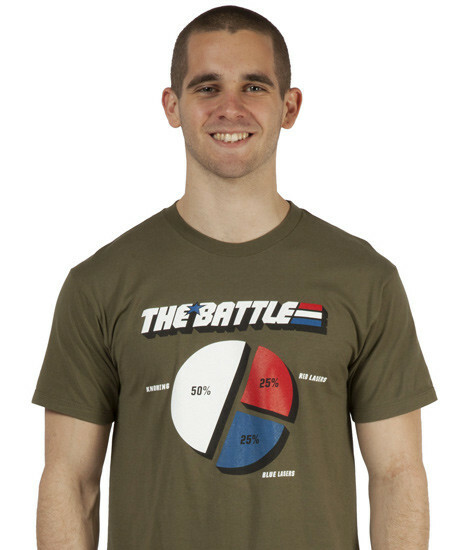 Joe t-shirts pay tribute to the catchy phrase with a pie style diagram that shows that knowing is half the battle, while red lasers and blue lasers make up the other half. Add this tee to your collection of G.I. Joe clothes. In addition to the Knowing is Half the Battle tee above, browse the G.I. Joe Clothing Gallery for more apparel like men's and women's clothes, kids shirts or hoodies.